I wanted to start with something that made me smile. It was the write-up for this auction. I was kind of shocked to see that he gave credit to the website. Honestly, I really appreciated it. I doubt most people would do something like that. The part that cracked me up is underlined in red. He then read part of the first paragraph, copied the first three paragraphs, and then pasted it into his auction. 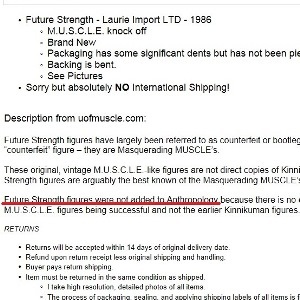 I don’t think many buyers are going to care about Future Strength’s exclusion from Anthropology. It’s a very small thing, but I like when small things can make me smile. Last week I threw together a last minute contest. There were ten entries, which I think is pretty good when I didn’t know what I would provide to the winner. I thought this would be an easy, fun contest. That never works out for me. For example, this led to this and the Toys for Tots thing was a total fiasco for me. The trend continues. John McKinnon was the winner of the contest. His guess of $575.06 was the closest at $60.06 away from the final price. However, John was also the buyer in the Purple #153 auction that went sideways. Regardless of where you place the fault, it feels wrong to reward that situation – and I have always liked John, which makes things even worse for me. Ultimately I’ve decided that Biffard is the winner with his $605 guess. Sorry John. Sorry if people don’t like it. It’s my contest and I’ve got to do what feels right to me. I hope everyone understands. – Class A Green #42. I wonder where the reserve price is set. 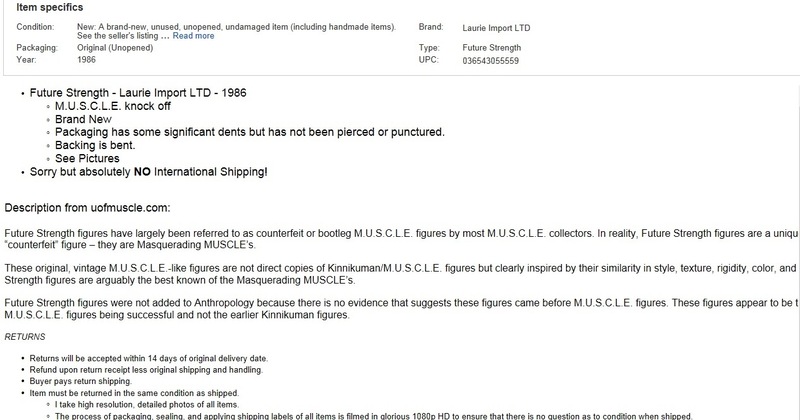 – If you can’t wait for my write-up next week, then buy this amazing MUSCLEMANIA bootleg. – Lot of 25 starting at $2.99. – Is that a blue or black Akumoko? – I don’t think he knows he has a FLAF. – $80 on any M.U.S.C.L.E. seems silly to me. This seems insane. – I like the counterfeit figures. Not terrible at $0.29 per figure. – Two 15 figure lots starting at $0.99: one and two. – Can you really call one figure a “lot?” At least it’s only $0.01. – Oof. $0.62 per figure and they look kind of dirty and stained. – I’ve never seen that before. – This doesn’t seem like the best way to sell these things. – I don’t love the price, but I do love this belt and its great box. 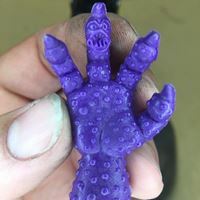 – 15 Flesh figures starting at $0.99. – Philly. You’re better than clogging eBay. So long and thanks for everything! 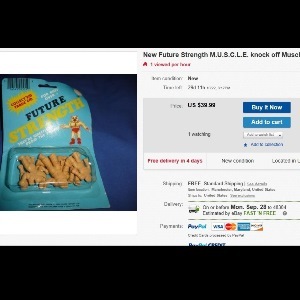 I think I have to walk away from M.U.S.C.L.E. toys. I’ve seen a $5 Purple #208 for sale on eBay. Even at $2.99, I’ve got to go. This entry was posted on Friday, September 25th, 2015 and is filed under UofM News. You can follow any responses to this entry through RSS 2.0. You can skip to the end and leave a response. Pinging is currently not allowed. I agree with you completely on your choice of winner. It would have been one thing if he would have paid for the auction that he bid up to his contest guess, but he didn’t. Sabotaging someones auction to win a prize is very petty and crappy. I bid on the claw; but I stopped bidding way under my apparently over inflated guess, as I knew I couldn’t afford it. Congrats Biffard! I don’t think John was screwing with the auction to win a stupid prize from me. The situation with the #153 is sad. Both sides are part of the problem. It’s a shame it didn’t work out, but there isn’t a clear villain. Hey man sorry to hear your done with muscle. It kinda doesn’t feel good to be new to collecting them and have someone as seasoned as you to be leaving. Makes me feel so much farther from my goal. I can only imagine what you went through already to put together the set you have. Honestly, I didn’t go through anything. It was fun. However, I can pinpoint the moment it stopped being fun. I can pinoint the auction (can’t grab a link right now). It was the moment that I realized things had spun out of control.